Narcissistic Personality Disorder (NPD) causes many issues in all aspects of a person’s life. It affects work, school, relationships and other matters. It can worsen with depression and addiction. Someone who is a narcissist is usually unhappy and easily disappointed by others for not receiving the special treatment they believe to deserve. Their relationships are usually empty and disconcerting.Their reality doesn’t measure up to their beliefs of what they see in themselves. It’s hard for the narcissist to accept that the world doesn’t revolve around them alone. 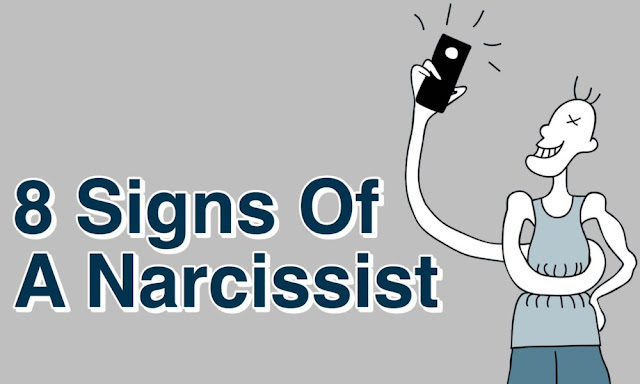 You can detect a narcissist pretty quickly when you begin to notice the red flags. 1. THEY EXAGGERATE THEIR ACHIEVEMENTS AND TALENTS. The narcissist will tell you that he was an all-star athlete in school when the reality is that he was rarely ever on the field. He will overplay any life event to look as if he was the star of the show. And, when he shares his achievements over and over, they actually become a reality to the person. They believe they have accomplished all the things that they share with others. 2. THEY ARE MASTER MANIPULATORS. The narcissist will utilize your weakness to ensure that they get what they want. They will degrade you, using your weaknesses to add more power to their personality. If they do you a favor, be sure you’ve sold your soul to the devil because it will come back to haunt you. 3. THEY DON’T RECOGNIZE OR ACCEPT YOUR FEELINGS. The only thing that counts is how they feel. The narcissist will be sure to bulldoze your emotions to make themselves feel worthy. A person who suffers from NPD is only concerned with how they feel. Emotions are driven by they need and desires. The narcissist is never wrong. They believe they are entitled to everything. They will brag and step over anything or anyone along their path to get the things they want. This disorder doesn’t allow for the person to have a rational moral compass. They aren’t sensitive to anyone’s feelings. They show no empathy or apathy. 5. THEY REQUIRE CONSTANT ADMIRATION AND ADORATION. The narcissist needs to be the center of attention. When the attention is no longer available, they will move onto another person. They cannot keep relationships for long because no one can keep them on a golden pedestal. They have difficulties keeping jobs and focusing on school as well because they lose interest quickly. 6. THEY TAKE ADVANTAGE OF OTHERS. The narcissist will take advantage of anything and anyone to suit their needs. This means stepping over anything to reach their level of twisted goals. The narcissist appears to have self-confidence and high self-esteem, but it’s a facade. They are lacking self-worth but compensate it by using others to their best interest. 7. THEY ARE ENVIOUS OF OTHERS. The narcissist cannot accept anyone better than themselves, therefore, when the attention is on someone else, they get angry. They suffer from severe depression and frustration. They become enraged. They are envious of anything that doesn’t come to them and their attention. 8. THEY BELIEVE THEY ARE SUPERIOR. Narcissistic Personality Disorder is a mental health issue.They aren’t making it up. They are mentally incapable of seeing the world like everyone else. They believe they are above anyone. Their grandiose attitude is overwhelming. They do no wrong. When something doesn’t go their way, it’s because of someone else who messed up. There is no way to rationalize with their behavior. It’s not fully understood how a person becomes a narcissist, but they do have some common background influences.This personality disorder can be diagnosed as early as puberty and preteen years. Usually a parent gave excessive pampering or excessive criticism in childhood years. They might have come from a broken home, having abandonment issues that forced them to rely only on themselves. These people have substituted the lack of love and support from a parent by over-emphasizing their own worth.Narcissistic Personality Disorder seems to affect more males than females. It’s important to recognize the boundaries between an unhealthy ego and that of a narcissistic personality disorder. Sometimes the lines seem to overlap. The above signs are some of many that differentiate a narcissist from a person who has self-assurance and confidence.